The original oil painting is painted on high-quality cotton canvas, 36″x24″. My palette knife impasto painting technique creates a lively textured surface, with really thick paint. The original is no longer available. 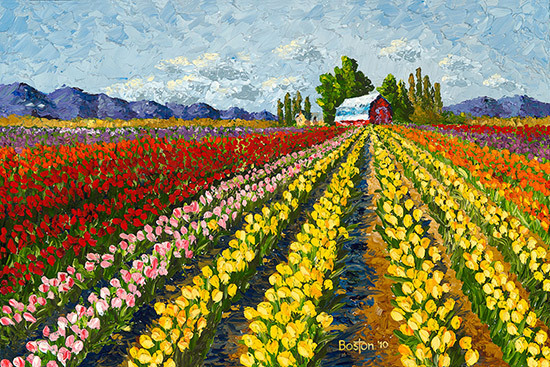 The tulip fields of the Skagit Valley in Washington state are simply amazing. Infinite rows of bright colored tulips and daffodils and the lead characters in the Skagit Valley Tulip Festival every April. This is a fairly typical scene of a huge field of flowers with the supporting farm house in the distance.